If you missed it this morning, be sure to check out veteran election law expert Gerry Cohen’s essay in Raleigh’s News & Observer in which he dissects the proposal from Republicans at the North Carolina General Assembly to alter the state constitution with a voter ID amendment. As Cohen makes clear, the proposal is rife with a host of serious problems. “The ballot question says, ‘Every person offering to vote in person shall present photo identification before voting in the manner prescribed by law’ This language appears to not allow exceptions for those without ID or those who have lost them, as the 2013 law did. Will it be a ‘hard ID’ like that struck down in federal court, or a ‘soft ID’ like the 2013 House version that allowed student ID, public assistance ID or employer ID? Will there be a tedious provisional ballot process? “A large segment of society, especially the poor, don’t fly and don’t have checking accounts. 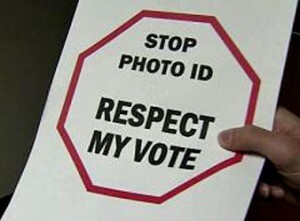 Research has shown that the poorer the voter, the younger the voter, or if the voter is black, the less likely there is an acceptable photo ID. Also, why are we writing into the constitution 2018 technology, disallowing other methods that may develop? I’ve seen attacks that people without ID could easily get one. For many, this isn’t true. Those of us in politics are privileged to be in the top 95 percent of society. We often don’t see the struggle of citizens who are un-banked, poor, homeless, mentally ill, with no car, or living far away from DMV in rural areas. The lesser among us deserve respect and honor, not baseless fraud allegations or artificial and unnecessary barriers to voting. This bill will disenfranchise voters and is poorly thought through. No one is breaking into the voting booth. Most voter fraud is in mail-in ballots, not touched by this bill. The other major fraud in 2016 was largely baseless post-election fraud accusations made by representatives of a campaign, organized by Virginia lawyers who duped volunteers into signing false allegations. The bottom line: Cohen is right that the amendment would be a disaster and must be stopped.